يوفر ميريتون سويتس برودبيش مكان إقامة فاخر على بُعد 5 دقائق فقط سيرًا على الأقدام من الشاطئ، وتشتمل مرافق الترفيه على مسبح داخلي وخارجي وساونا وحوض استحمام ساخن ومركز للياقة البدنية، وتتميز بعض الأجنحة بإطلالات خلابة على المحيط، ويتمتع الضيوف بخدمة الواي فاي غير المحدودة مجانًا في مكان الإقامة، ويُمكن للضيوف الدفع ببطاقة يونيون باي. تتميز الأجنحة المكيفة بنوافذ يمكن فتحها ومرافق غسيل الملابس، وتحتوي جميع الأجنحة على تلفزيون إل سي دي مع قنوات الكابل ومشغل دي في دي عند الطلب، فيما تشتمل الاستوديوهات على مطبخ صغير، في حين تشتمل جميع الأجنحة الأخرى على مطبخ كامل. يقع ميريتون سويتس برودبيتش على بعد 5 دقائق سيرًا على الأقدام من كازينو جوبيترز ومركز غولد كوست للمؤتمرات، ويبعُد مسافة 10 دقائق سيرًا على الأقدام من مركز باسيفيك فير للتسوق. يُمكن للضيوف الاسترخاء في الساونا أو تناول وجبة في منطقة الشواء، ويُعد التراس الخارجي مكانًا مثاليًا للاستمتاع بشمس غولد كوست المشرقة. يشتمل مجمع الشقق على متجر صغير ومطاعم، كما يتوفر عدد من خيارات تناول الطعام على بُعد 5 دقائق سيرًا على الأقدام. يرجى الملاحظة بأنه إذا لم يصل الضيوف قبل الساعة 11 مساءً حسب التوقيت المحلي من تاريخ الوصول دون إبلاغ مكان الإقامة مسبقاً، فإنه سيتم إلغاء الحجز وخصم التكلفة الإجمالية للإقامة. يجب دفع الوديعة عند تسجيل الوصول، ويتم استرداد هذه الوديعة/التأمين عند المغادرة. يتم تحديد مبالغ الوديعة كما يلي: - الاستوديو/الأجنحة المكونة من غرفة نوم واحدة: 100 دولار أسترالي كحد أقصى - الأجنحة المكونة من غرفتي نوم: 200 دولار أسترالي كحد أقصى - الأجنحة المكونة من 3 غرف نوم: 400 دولار أسترالي كحد أقصى يرجى العلم بأن مكان الإقامة لا يقبل الدفع نقداً، ويجب إجراء جميع عمليات الدفع بواسطة بطاقة الائتمان. بطاقة الائتمان: يرجى الملاحظة أنه يتم خصم تكلفة بنسبة 1.5% عند الدفع بواسطة بطاقة ائتمان فيزا أو ماستر كارد أو يونيون باي. يرجى العلم بأنه يتم خصم رسوم بنسبة 2.9% عند الدفع بواسطة بطاقات ائتمان أمريكان إكسبريس أو داينرز كلوب. يرجى الملاحظة أنه قد يتم تغيير تكلفة بطاقة الائتمان في أي وقت، ولا يخضع نظام الدفع الإلكتروني EFTPOS لهذه التكاليف. يجب أن تتطابق بيانات بطاقة الهوية السارية مع بيانات بطاقة الائتمان عند تسجيل الوصول. يرجى العلم بأن مكان الإقامة هذا يطلب إجراء تفويض مسبق على بطاقة الائتمان عند الحجز، ويرجى التأكد من وجود رصيد كافي في بطاقة الائتمان الخاصة بالضيوف لضمان تأكيد الحجز الخاص بهم. أنواع الأسرّة: تحتوي جميع غرف النوم (باستثناء الاستوديو والأجنحة القياسية) على سرير كينغ مع مرتبتين بسحاب ويمكن فصله إلى سريرين مفردين. يرجى من الضيوف إبلاغ مكان الإقامة قبل الوصول عند الحاجة إلى فصل الأسرّة. يمكن للضيوف طلب ذلك من خلال خانة الطلبات الخاصة عند الحجز. ليلة رأس السنة الجديدة: يتم خصم تكلفة الإقامة لليلة 31 ديسمبر عند إجراء الحجز (أو في يوم العمل التالي)، وسيتم تطبيق شروط وأحكام إضافية لذا يرجى الاتصال بالفندق للحصول على مزيد من المعلومات باستخدام بيانات الاتصال الواردة في رسالة تأكيد الحجز. حجوزات المجموعات: يرجى الملاحظة أنه يتم تطبيق سياسة فندق مختلفة على حجوزات المجموعات المكونة من 7 غرف أو أكثر، كما يرجى التواصل مع مكان الإقامة باستخدام بيانات الاتصال الواردة في رسالة تأكيد الحجز للحصول على المزيد من المعلومات. Clean, quiet, spacious, modern, excellently located self-contained apartments in Broadbeach. The suites are walking distance to the beach, restaurants, Pacific Fair Shopping Centre and tram stops. Staff are friendly and helpful. We stayed in a two bedroom suite and we thoroughly enjoyed our stay. 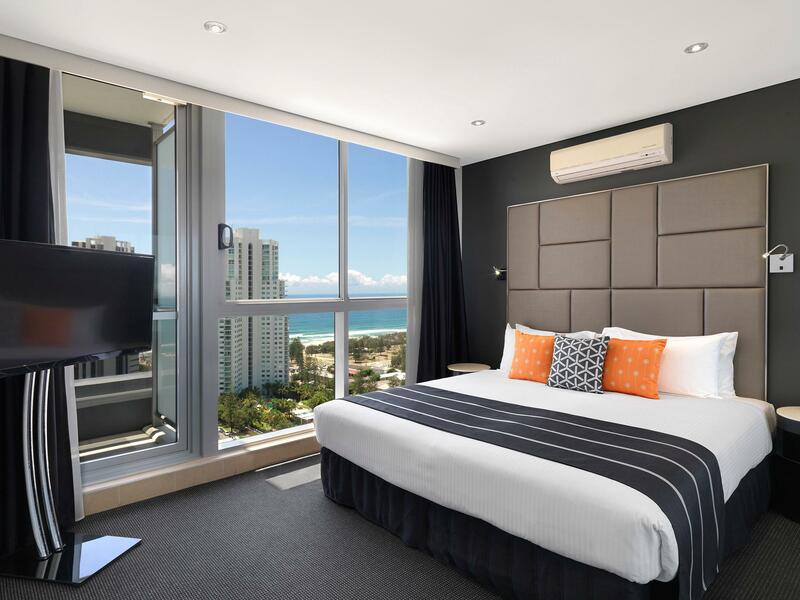 We would not hesitate to stay at the Meriton Suites Broadbeach again. Ask for a high floor to enjoy the marvellous view. it was an enjoyable stay, we are a group of 2 couples, so the 2 bedroom suite with 2 bathrooms was very spacious, with a fully equipped kitchenette! location was good too, just a short walk to tram station and woolworths is 5mins walk away. parking was easy too. indoor pool is available but it is not heated so in this cold weather was a little impossible to swim. all in all it was a great stay and will definitely choose Meriton again the next time! We had a conference to attend at the Convention centre. The location of the Meriton was perfect for this! I could not fault the hotel in any way. There were 5 of us and we stayed in a 3 Br apartment, it was beautiful! Value for money, studio room includes washer and dryer which was a surprise! Spacious room and toilet with full kitchen equipments. Friendly staffs, location near to bus stop for bus "777" to Gold Coast airport. What else can you ask for at this price? I loved my stay here. The staff were behind friendly and always made you feel extremely welcome. The apartment itself was beautiful and so spacious. I had an ocean view apartment and wow is all I can say. Will 100% be staying here anytime I'm in Broadbeach! Well worth the money. Everything you need are provided. Will definitely stay there again. just 3 mins walk to broadbeach south station and about 5mins walk to broadbeach north station. Pacific Fair shopping centre and Oasis shopping centre are all within 10mins walk. Many cafes downstairs. Apartment was spacious and everthing was clean and in good order. Reception staff were attentive and friendly. We had no problem with building noise from the casino but we were on the ocean side of the building on the 19th floor. so good, has everything you need during the middle of your trip. we appreciated the washing machines as we were running out of clean clothes. the place needs to improve on ventilation. the hallways smell of food and sometimes the room as well. The experience was good. The room was very clean and well maintained. The was a fire incident and the staff handled the situation in a calm and organised manner. They provided regular updates and provided drinking water to the customers. The parking should be complimentary even though it was $10 for a full day parking. Location, size of rooms, quality. This was our second visit and we were still very happy with the apartments. They had a little problem with the Internet, due to the NBN network being installed, but, it should all be fixed by now. I'm not certain whether prices are seasonal, but, it seemed much more expensive this time. We opted to stay in a serviced apartment to have the option to eat in if we wanted to. We were VERY HAPPY with the apartment, it was equipped with everything that you could need and if it wasn't the staff were happy to help. The location is excellent, within walking distance to the beach, shopping centres and restaurants. I would recommend Meriton to anyone and I will be staying again! My stay was great. The view and facilities were amazing and the room was clean and comfortable. There were nice thoughtful things like washing up liquid and cloths provided and I loved the paraben free personal care products. There a mistake made in the system regarding a late checkout, and manager went above and beyond to fix the problem. Will definitely stay there again. Really loved the room, very spacious and well kept. Furnishing was modern and in great condition. There was daily housekeeping despite being a service apartment and it felt clean and very comfortable. We had a swim in the indoor heated pool and it is not too hot but still good for the mild gold coast winter. We had a good stay. It wasn't my first stay here, and once again I feel really good staying at Meriton BroadBeach. Pacific Fair is about 10-15 mins walk,and it is near to bus and tram station. Comfortable stay and will definitely be back for next trip. Stayed in a studio for one night while on the coast for a party. Room was fine and could walk to Broadbeach. Nothing flash but certainly did the job. Would return there if needed a place to stay on the coast overnight. I often travel to the Gold Coast Convention centre. Meriton is right across the road and a short stroll to the Casino, Broadbeach restaurants and the beach. Well priced, this is modern hotel is a perfect solution compared to some of the more expensive hotels in the area. Booked this place for my parents, and they couldn't stop raving about how good it was for its price. Room was modern and clean, close to shops, close to casino, and 5 mins walk to the beach. Couldn't really ask for more. Parking is roughly $10 a night when my parents stayed, which they were happy to pay considering it's a reasonable price. Don't think I could say anything else really. It was a really happy experience and they would stay at Meriton Broadbeach again if they go back to the Goldy.